A 23-year-old man has died after being stabbed in a south London youth club. Police were called to Minet Road, Brixton, at about 18:45 GMT on Thursday where the victim was given first aid by officers at the scene. He was pronounced dead at 19:27. His next of kin have been informed and no arrests have been made, police said. Det Ch Insp Mick Norman said: "This was an appalling attack on a young man in a youth centre - a place where he was entitled to feel safe." "All the early indications are that this attack was premeditated and targeted", he added. Sandra Smith, whose son was friends with the victim, said her "heart bleeds". "He is a good boy, he is not the sort of boy who goes out and gives trouble," she said. Image caption Police believe the attack was "premeditated and targeted"
Maxine Dawson, 46, said she had been outside and seen children as young as seven leaving the centre after the attack. "I can only imagine the way they were traumatised," she added. 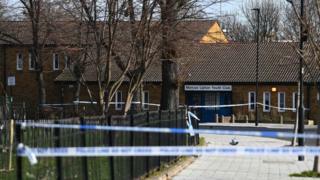 Pastor and community campaigner Lorraine Jones, whose 20-year-old son Dwayne Simpson was stabbed to death in Brixton in 2014, said the youth club was one of only two in the area serving about 8,000 children. "The club has been going for many, many years. They have done a huge amount of work, hundreds of thousands if not millions of hours with young people and they need help." Police want to hear from those who were at the youth centre either before, during or after the attack. "The youth centre was open at the time and sadly many young people present would have witnessed what unfolded," Det Ch Insp Norman said. The killing brings this year's homicide rate up to 14, nine of which were fatal stabbings. Between October 2017 and September 2018 the number of knife crimes in London hit an eight year high, according to figures from the Office for National Statistics (ONS). In 2019 there have been nine fatal stabbings in London so far.